After a great night out last night at an 80's disco in the Greville Arms I was feeling a little tired so I had a power nap in the afternoon. When I woke up it was dark so I had a look at my phone. I jumped out of bed in a panic and pulled back on my boots, I go up to Mam every Saturday to look at Strictly Come Dancing, which was starting at 18.40. I raced put the door, into the car and up to the Camillians. It was only when I was at their door, ringing the bell that I looked down at my feet. How the hell could I have gotten it so wrong? I know I got redressed in the dark, but for God's sake. 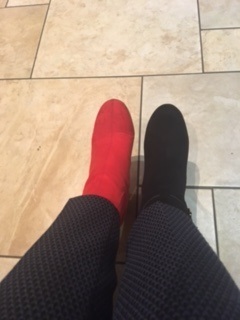 RED AND BLACK??? #1 Signs that I'm officially old.